On May 5th we celebrated Cinco de Mayo and Beth's birthday in Sneaky Syamper style: good Mexican food, margaritas and card crafting!!! Veronica created beatiful cards! Just love love love that umbrella card! 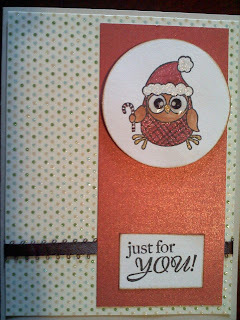 And the bird, distressing, embossing card was super fun to make! We had a great little get-together last Saturday. We crafted, drank cosmo's and ate some yummy cake to celebrate my birthday! 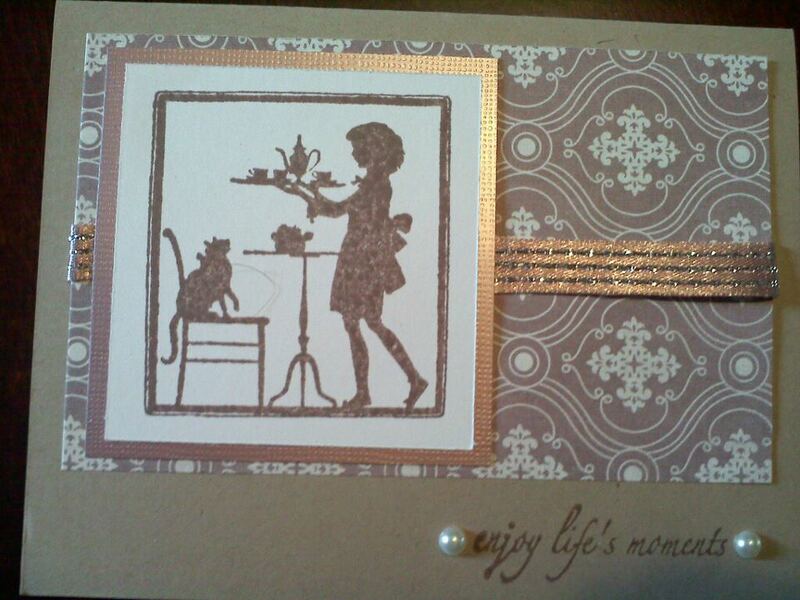 We also converted Veronica's lil sis Beth into a card crafter and this was her first sneaky stamper designer session. She came up with the following fun rooster card! 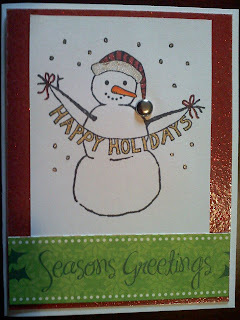 I challenged Sindhu this week to make two very colorful cards and she did a fabulous job! 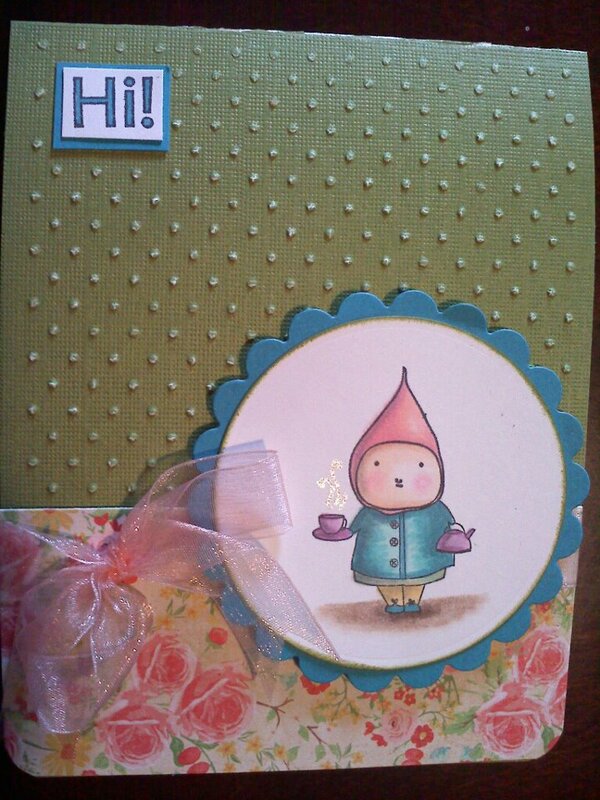 Lastly, Veronica designed 4 super cute cards! I hope that we can craft again some time soon! Perhaps for my upcoming birthday!! What a great Friday evening we had! Our Sneaky Stamper Club met again, and this time Kathleen and Missy joined us! 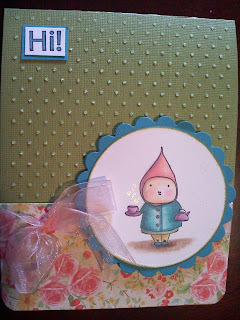 First up, we created this very cute card that Kathleen designed. We embossed the butterflies with pink embossing powder and added some "bling"!! Don't you just love the color combination? 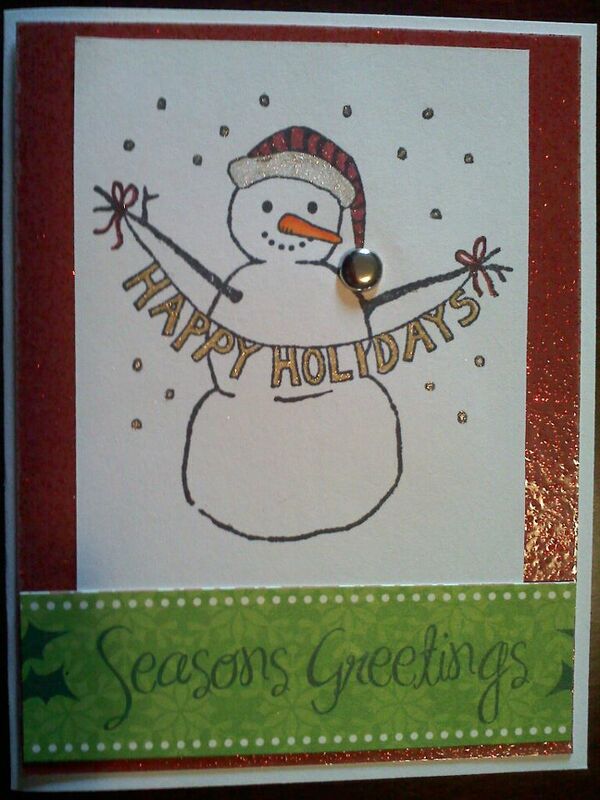 Next, we have the card that Missy created. We used a punch to create the banner and a scoring board to add three lines on 2 sides of the card. Of course we added some sparkle by using a glitter pen to color in the little balloons above the Happy Birthday. Love this card! Veronica created two cards: the first card has little animals that we colored in with copics. Soooo adorable! And the second card is a girl holding a nice big glass of champage. To create the bubbly effect we added some stickles on the top of the glass. Again love this color combination! Sindhu also designed 2 cards. We made this georgeous teal peacock card, where Sindhu taught us a new technique to create the background. Just ink up a cuttlebug folder, put your paper in between and run it through the cuttlebug machine. And Voila! We also made a cute friendship card! Love the little button detail! Lastly, I created a more masculin mustache card and a bird cage card. For the bird cage card, I had everyone create their own background by stampin bird cages randomly in two different colors. It came out pretty nice, if I may say so :-)! Well, that was it. I hope you like all the creations as much as we do! We had a great time and hope to do this again soon!! Sneaky Stampers met again and what a great night we had! While our husbands were watching football, us girls made 7 cards! First up: Sindhu's cards. She made a very cute "hello" card using white chalk ink and a large tree stamp, to finish it up, she added a paper flower and a green brad. For the second card, Sindhu used her newly bought Hero Arts stamps from the 2012 catalog. Aren't they adorable? Veronica brought 3 awesome cards which were lots of fun to create. I just love all three of them! The first one is a bike that is hanging in the air with red heart ballons. We made the balloons pop by adding some glossy accents to it. In the inside of the card, we stamped Love is in the Air, which fits this card perfectly! Veronica's second and third card were so much fun to assemble. The second card, we used our copics to color in the girls and inside the card, I used the stamp "Can I borrow some Weight Watchers Points". 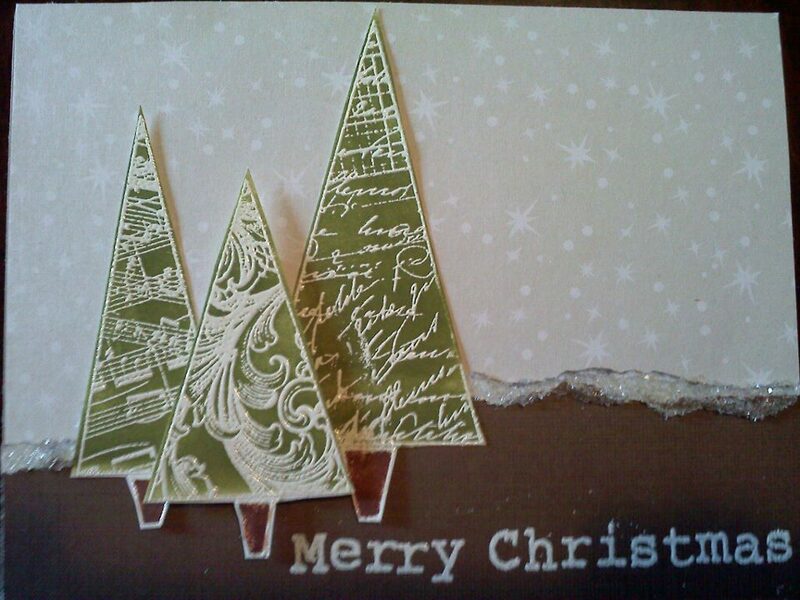 For the third card, we first put down a few layers of yellow, green, brown and blue distressing ink. Then we embossed the rays and circles with clear embossing ink. We added more distress ink in all different colors...and some more...and just a little bit more until we got the result below.. lastly we stamped the stars and the background and glued the city cut-out on the card. Lastly, here are the cards I (Nathalie) created. I wanted to keep the design clean and simple ("CAS"). I chose to use the color combinations for this month's contest by Hero Arts. The cards I submitted into the contest have different sayings but the designs are exactly the same. Our next meet-up won't be until somewhere in March due to some busy weekends, but that will give us plenty of time to come up with new designs! Last Friday, we celebrated Sindhu's birthday! Little bit early, but she is going on vacation soon, so five of us girls got together. We drank some cosmo's, ate some good food and of course made some cards. 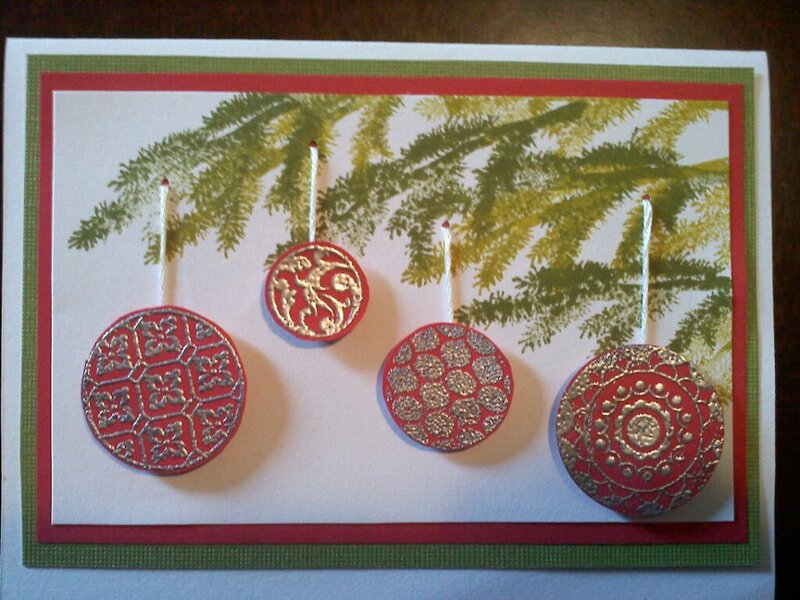 Veronica, Sindhu and I each desigend a few cards and then all 5 of us replicated each design. It took us about 4 hours to finish 2 drinks, appetizers, dinner, cupcakes and 7 cards. All of that while we were chatting non-stop, of course! This first two cards are created by Veronica. She used a stamp from poppystamp.com for the first card and the inside of the card has a pocket with a tea bag in it. Super cute design! The second card used the circle stamps from StampingUp. The following two cards are designed by Sindhu. 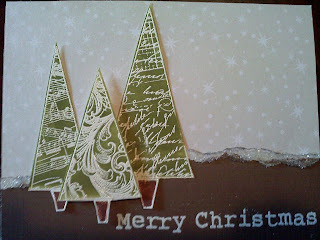 She created two super fun christmas designs using Hero Arts stamps! Lastly , here are the cards I created. I also used two stamps from Hero Arts. 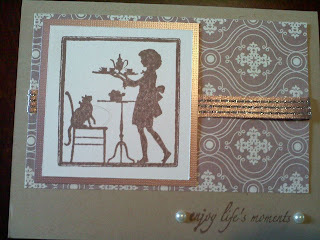 Don't you just love that "tea time silhoutte" stamp! Adorable! We will have another card making evening as soon as Sindhu is back! So see you soon! We are three girls that just love to chat, eat, drink and craft..preferably all in one evening! Who are we? Well, Veronica is an awesome artist! She is the most experienced crafter of our group. Nathalie is somwhere in the middle craft-experience-wise. Last, but not least, Sindhu just started card making a few weeks ago, she is a quick learner and is definitely sneaking up on us experience wise!